Foodie is a dangerous term. Foodies argue endlessly about the provenance of the oregano in a chef’s Sunday gravy, or bicker about the appropriate number of pounds to press the espresso puck to pull a correct Americano. Flame wars erupt amongst them about the proper use of Himalayan salt, or Nepalese salt, or Hawaiian lava salt and which goes correctly with organic wild basa, instead of farmed basa. If we want ‘genuine’ Kerala Chicken Curry, we’ll go to Kerala and get it in Kerala from a sketchy street vendor, instead of arguing over the spice mixtures and whether the cocoanut milk is fresh or canned. We approach food differently, eschewing the esoteric hipster-approved pseudo-experience of “genuine”or “authentic” cuisine, for things that Taste Good. To which we present something that Tastes Good. It is called Steak Rolendeli. In an Esquire article, Man At His Best, November 1990 the late Jim Enger described a dish of such remarkable beauty that we have kept the magazine, now stained with butter and meat juices and have actually prepared Steak Rolendeli three times. Each time those around the table have been enthralled at the simplicity and beauty of the recipe and marked it as one of those meals that one remembers for a long, long time. It will also make you a Kitchen Deity for years to come. Go to the butcher. A real butcher that understands beef, not some gormless mook that merely stocks the racks with hermetically sealed pre-digested, pre-portioned cow parts. Point at the sirloin steaks and ask to buy the primal cut that those steaks came from as one big whole. Many butchers get their meat in big chunks and cut it down from the primal cut, usually packed in a Cryovac bag, from their meat distributor. If you have a butcher that gets actual carcasses of beef, tell them you want the whole sirloin, cap on. It should weigh about 17 to 20 pounds. This will cost you more than $100, but it will be worth it. Trust us. Stop at the supermarket on the way home from the butcher, get two pounds of unsalted butter, two pounds of salted butter and three boxes of regular table salt. Swing by the bread department and get two loaves of the best, crusty Italian or French bread you can wangle. If you have a baker nearby get the two best they have in a crusty, white baguette or freeform loaf. Salad? Sure. You can make a salad if you wish. Nobody will eat it, but you can make it. Call up four to eight excellent friends with good appetites and get enough wine to go with this meal. Or beer, or bourbon. Drinks are mandatory, but as to what, we’ll leave that to you. Whatever goes with beef and is of a modest price is your objective. At home, open the package from the butcher to gaze upon this hunk of meat. You’ll need a sharp knife to take off the fat c ap (or if you butcher knows what you’re creating, will do it for you. This is the time to have a very sharp knife. You want to trim the fat cap down to where there is a thin layer of fat on the top side. You might have to whittle the fat cap off in smaller pieces and it might take off a pound or two of weight, but you have plenty to work with. Place the whole thing in a turkey-sized roaster and let the meat come up to room temperature, which should take about an hour. Meanwhile take those two loaves of bread and cut them into slices, perhaps on the thinner side. Steak Rolendeli is about the meat, the bread is important, but thinner is better here. Put your oven rack as far down as it will go and put the broiler on about 20 minutes before cooking to get the broiler screeching hot. We have a gas broiler and it takes about 8 minutes to get to the point where you can sweat-solder copper pipe with it. Yours might take a little longer to come up to full temp. Obviously Steak Rolendeli will not work if your heat source is a $29.99 toaster oven from that fancy French store, Target. Open one of the boxes of salt. This is ordinary table salt, not kosher, or sea, or lava, or smoked. Simple table salt. Pour it all over the top of the steak. All of it. Every grain. 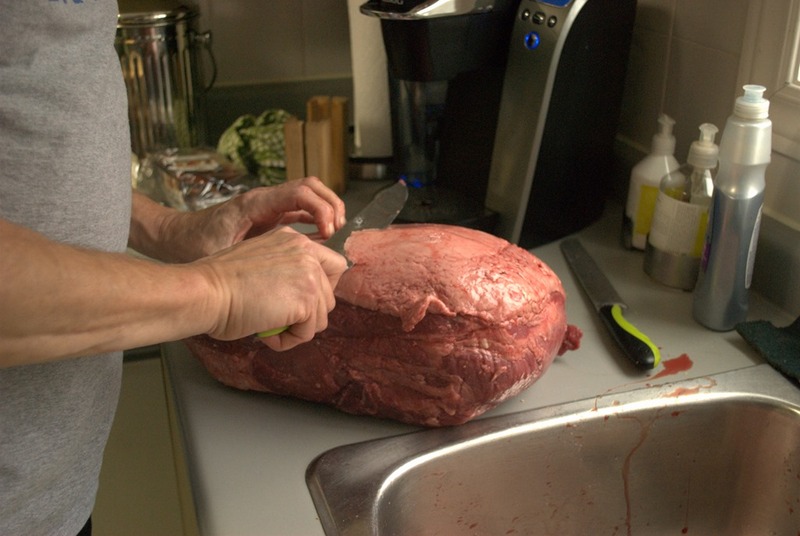 Tell your guests to hush as they will protest drowning a magnificent hunk of beef in a kilo of salt. You are doing something brave and fantastic that will have your friends talking for years, licking their lips in fond remembrance and hushed reverence for your status as a Kitchen Deity. 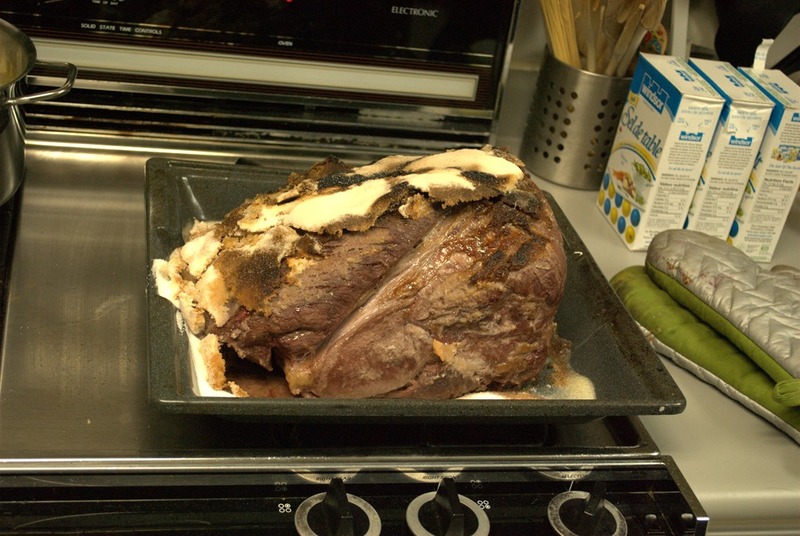 Put the steak, salt side up, under the broiler and set the timer for 25 minutes. Do not peek, as there is magic afoot! While the meat is broiling, melt down the four pounds of butter in a pot that you would make a big batch of chili, or boil pasta in. The pot should be big enough that the butter only comes up about half-way. Get the butter melted and simmering, not boiling: You should see the occasional bubble on the surface, not a full rolling boil, so go slowly. Once the timer goes off, take out the Steak Rolendeli and chip off the burned salt crust. It will come off in chunks, looking a little burned and hard, which is exactly what you want. Toss the salt out and brush off any excess. 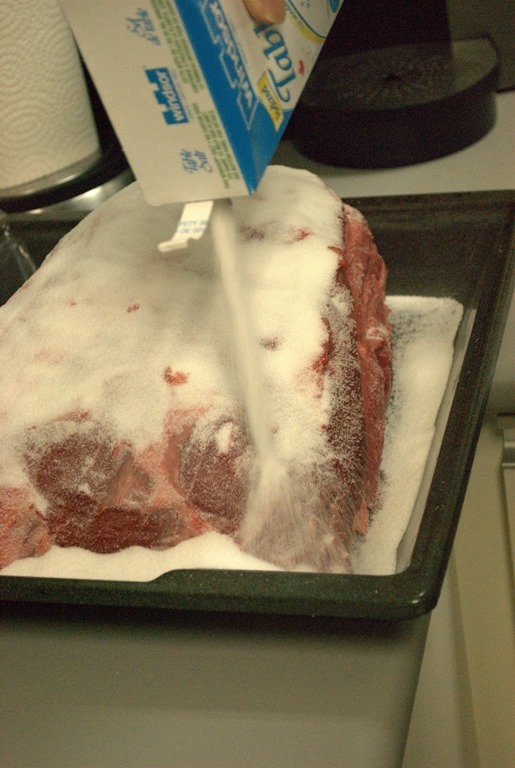 Flip the meat over and pour another box of table salt over the uncooked side and return the steak to the broiler. Set the timer to another 25 minutes and tell the now-yapping guests to shut up. These things take time. Open another bottle, or tell a long pointless story about finding the recipe on an obscure blog run by a crazed Canadian up in Ottawa named Smitty, based on an article in Esquire in 1990, by a guy who loved fly fishing in the UP of Michigan. When the timer goes off, the fun starts. Bring out the meat and chip off the salt again, brushing off the excess that didn’t harden up. Put the meat on a cutting board and chop it into fist-sized chunks. You’ll see the meat is on the rare side of rare, perhaps even blue in the middle. Plop one or two chunks into the pot, carefully, so as not to splash molten butter everywhere. Nominate one of your most trustworthy unindicted co-conspirators as the Runner, as he or she will be running plates of Steak Rolendeli to the table and acting as your able assistant. Send your guests to the table and tell them to prepare themselves. Fish out the first chunk of meat from the butter. It should soak for about two minutes. While you are slicing off pieces as thin as you can, your Runner is very lightly dipping one side of the bread in the butter and placing them on a platter. 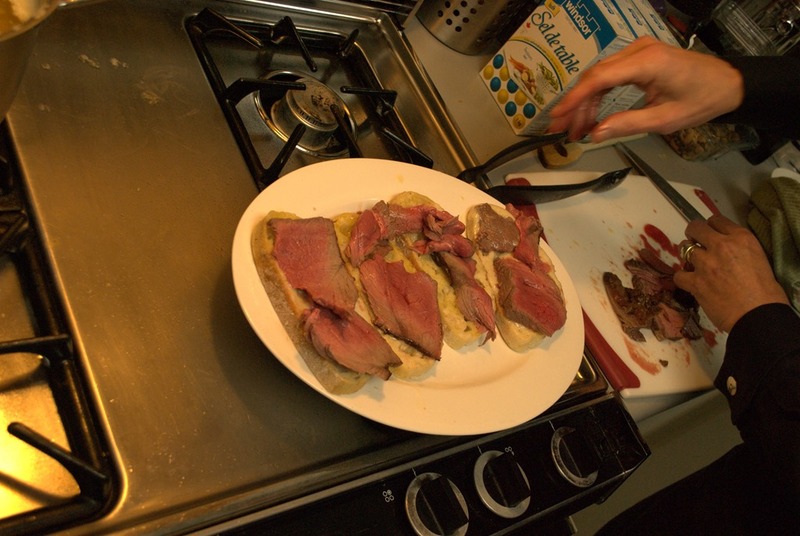 You cover the bread with razor thin slices of meat, cut against the grain. As your Runner delivers a platter to the dining area, fish out another big chunk and drop another one into the butter. 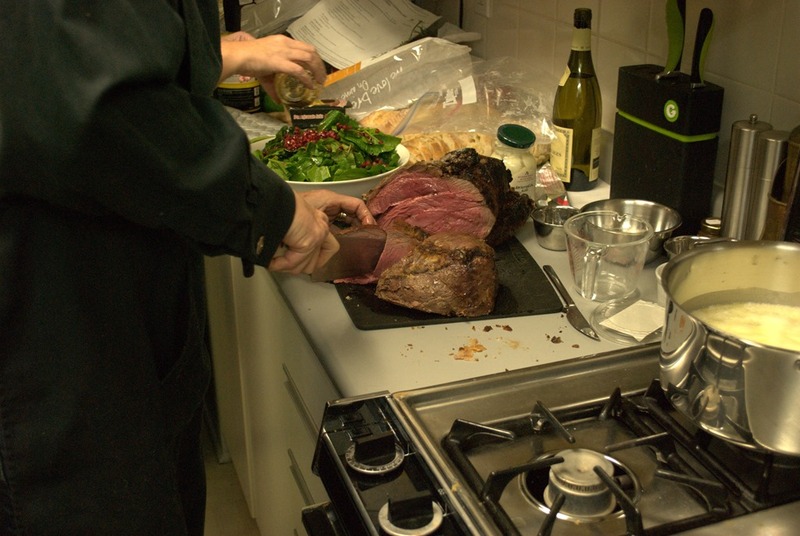 The Runner will load the next platter with butter dipped bread and you will continue to slice off the meaty goodness. Some rare, some medium and even some medium well, mixed across the bread slices will allow your guests to choose to their tastes. Those particularly fine pieces, with a bit of char that weren’t perfectly covered with salt? Those are hoarded to one side of the cutting board for you and your Runner. Dip, slice, place, run, repeat. You will notice a peculiar sound about the time the second platter arrives. You won’t hear your guests griping, harping, or complaining. You won’t hear good-natured bantering, laughter, or stories. Perhaps you might hear the occasional clink of a glass or the elegant chirp of silverware on a plate. You will hear a lot of silence and the comfortingly guttural sounds of people eating with lustful abandon. With luck you might hear the tiny jingle of a belt-buckle being undone discreetly under the table. After the third or fourth platter, herd that stack of very choice cuts you’ve been hoarding on the corner of the cutting board onto a slice of dipped bread for your Runner. This is their Just Reward. One last platter, this time asking your guests if they want very rare, rare, medium or well done and provision their bread as appropriate. You may now enter the dining area to your well-deserved applause and adulation, your Runner discreetly sliding into place at their seat, with their own special plate of Steak Rolendeli. What you have created, if you are of a culinary perspective, is a broiled, salt-crusted sirloin, finished by butter poaching. The beef is not salty, perhaps the top 1/32nd of an inch is, but not any more than that. The salt crusts under the heat of the broiler, trapping the juices in the meat, until you release them with that final quick poaching in butter. Tender, juicy, flavourful, remarkable sirloin of beef, served simply on well-buttered and meat-juiced bread. The other thing you have created is a memory for your guests of a meal they will not soon forget. You may now wear your jaunty crown as a Kitchen Deity which also entitles you to tell any obnoxious foodie to go climb a tree and hang themselves by their woolen hipster toque. We make food that tastes good. Oh my! Salt roasted, butter poached sirloin!? Yes, please!!! One of the classsic articles in Esquire history! Ok! That’s it! Time to do it again!